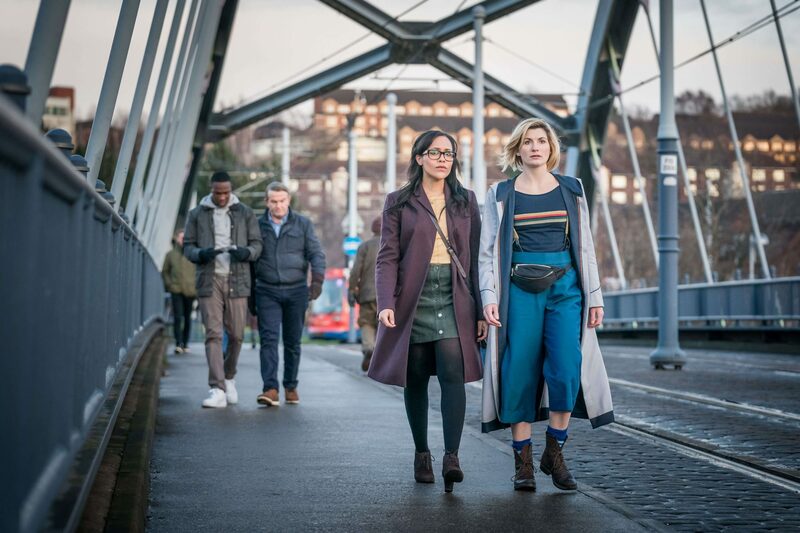 After a detour to Alabama, the Thirteenth Doctor (Jodie Whittaker) has managed to get Yaz Khan (Mandip Gill), Ryan Sinclair (Tosin Cole), and Graham O’Brien (Bradley Walsh) back to Sheffield, just in time for tea. But there’s something afoot. Or, I dunno, there’s something 8-foot? Work with me here. What did the rest of The Doctor Who Companion think of the episode…? Arachnids In The UK is a strange beast. It feels more like a first draft than the finished product. There are too many unanswered questions, dangling plot strands, strange motivations and characterisations (Yaz is a police officer yet commands no authority when That Bloke pulls outs out a gun?! ), ideas that go nowhere, missed opportunities (no spiders in Yaz’s flat then, despite that pointless pile of rubbish? ), and clunky dialogue for this to have made it to screen. Alas, it did, in fact, make it to screen. It’s also a lecture, but by now, that’s par the course. There were highlights – notably the “spider in the bath” scene. I pondered over whether it went too far, but set that thought aside because, hey, Doctor Who should be scary. 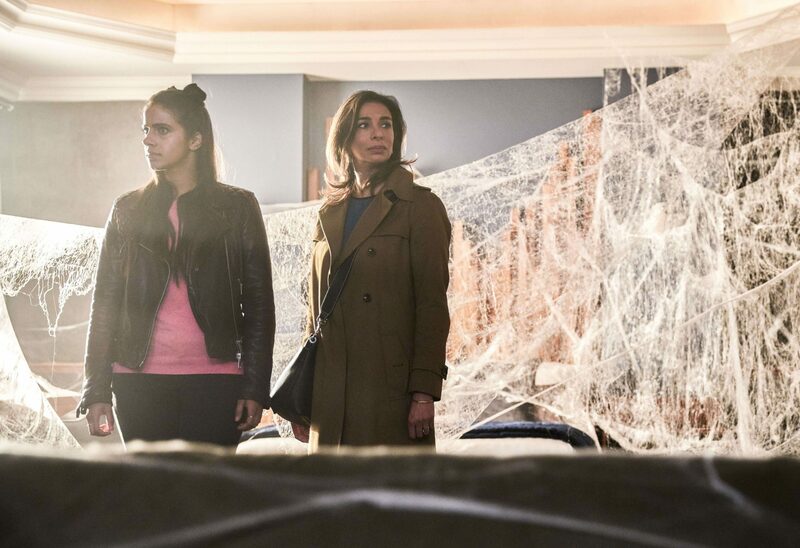 In the end, it wasn’t really the scares that spoiled this episode, nor was it dodgy acting from nearly everyone (Mandip Gill was once again very good, despite not doing all that much; however, I even felt Whittaker and Walsh were considerably lacking). No, the thing that ruined this episode was just how nasty it is. Chris Noth’s character was a caricature, but I liked him for doing what the Doctor couldn’t: he put that spider out of its misery. The Doctor’s morals are all over the place! She seems to display the same logical missteps as Owen Jones! It’s madness. The Doctor doesn’t like violence or guns, but apparently is fine with, effectively, torture. Lovely. The real drama should’ve been the Doctor facing up to the fact that, sometimes, you have to be cruel to be kind. Four episodes in, and Doctor Who still isn’t back. 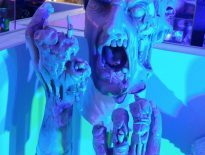 Swapping spiders for maggots and a Trump-alike for an evil computer, Arachnids entertainingly restaged The Green Death in Sheffield – but while it offered plenty of well-executed thrills and spills (or in this case scares), I’m not sure how much scrutiny the plot might withstand. 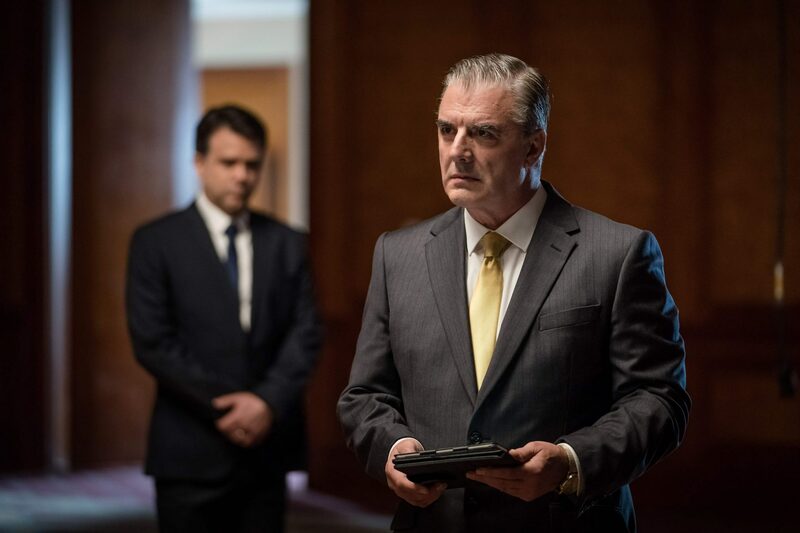 Chris Noth was hilarious as the vile Robertson, lying his a$$ off and shirking any responsibility, but he disappeared without the trace of a comeuppance and it reeked of unfinished business, far more than the Stenza and certainly Krasko. I kept waiting for a one-liner invoking a UNIT clean-up, or a suggestion that the Doctor might ‘accidentally’ release his unpleasant business secrets… I mean, didn’t you think he looked tired? On the family front, Yaz’s Dad and sister were fun, though rather surplus to requirements; the flat could have been empty and it would have made little difference. Instead we had Dad’s rubbish habit which purportedly connected to the landfill issues. With the lingering shots – plus a spider two doors down – I can’t help but wonder if there was a subplot on the cutting room floor involving a spider coming up the twice mentioned disposal? Mum on the other hand was gloriously embarrassing, but I was puzzled: if the hotel has been under construction for five years in the middle of Sheffield, and Yaz is a police officer, why does she need to be texted the address? Meanwhile, the Doctor was fun and frenetic and I liked her needy side showing; a Doctor showing they want people around them is a refreshing change from one who is told they should not travel alone. Although I’m not so enamoured with #TeamTARDIS, this Doctor calling people “dude” somehow fits too. Her anti-gun crusade continues apace, a nice counterpoint to Robertson’s gung-ho behaviour, but it is really more humane than letting the smaller spiders all starve to death (and turn on each other?) in that panic room? For that matter, did she go back for the one in the flat, or did it return to the hotel… how far did the music travel? 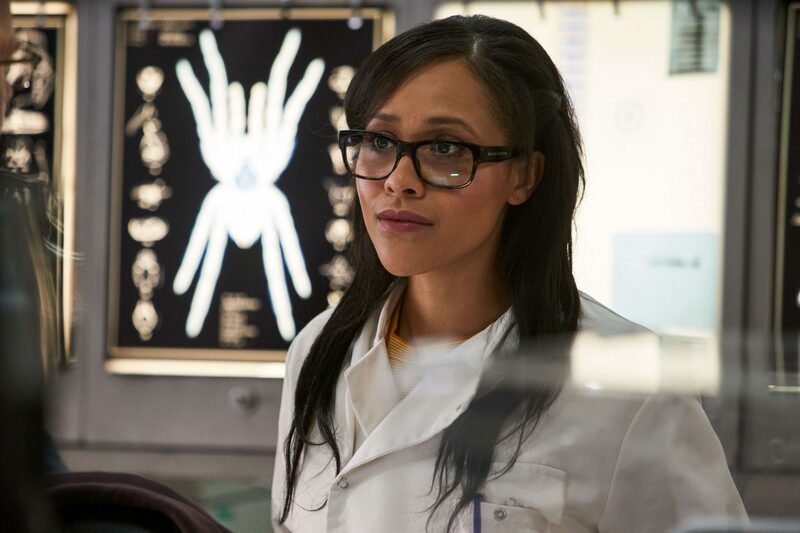 Arachnids is another beautifully directed episode with some lovingly crafted character moments – and I adore the new visualisation of the vortex – but there are so many questions. It’s maddening! Someone wake me up when it’s over. No, I am not scared of spiders or eight-legs or whatever. Nor am I scared of the Trump-wanna-be. I was simply bored. Totally bored. Yet another two-dimensional storyline, with a lot of Green Death written into it (abandoned coal mine, chemically infected insects, environmental back-drop), a touch of Planet of the Spiders with a hint of Harry Potter in the Forbidden Forest. The unmentioned perception filter must be the reason why no one on the housing estate noticed a police box outside… Come to that, I thought Sheffield had one and a half million in population, yet we see virtually no one around. Another story short of extras. In fact, the Spiders were unconvincing, so perhaps it is another story short of budget (cue The Woman Who Fell To Earth and The Ghost Monument)? I was hoping that I missed something, so I watched it again. The second time around, it was easily forgettable and even more dull. The only saving graces were meeting Yaz’s family (sort of keeping up with the Martha Jones’), the growing ‘affection’ between Ryan and Graham, and the dream appearances of Grace. I continue not see any chemistry between “The Doctor” and the three companions, although the companions themselves are now gelling as a sort of team. This time they nearly had different scenes to do. Final Verdict – episode four – the least interesting and least dynamic and least feasible storyline so far. Out of all the episodes so far I certainly enjoyed this one the most. I’m not sure whether it’s because I’m getting used to the pacing of the Chibnall-era or that that the character’s motives and plot were clearer. Okay, it was clearly a love letter to The Green Death and ultimately it did feel more like an episode of the Sarah Jane Adventures than Doctor Who, but in a way those were the episode’s strengths. There is a very strong Russell T Davies influence in this episode, from the estate to the use of a modern music genre to attract the spiders. 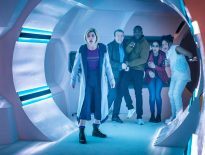 Unfortunately, this does tend to highlight that Chibnall is no Davies, but hopefully a voice that is more uniquely Chibnall will start to emerge as the series progresses. This script felt a lot more sure of itself than the previous three. With this episode, the shape of Chibnall’s Who is becoming apparent. This is now very much an ensemble show. The programme is much closer to the early Hartnell era than at any point in the last 55 years. Returning to modern day Sheffield gave the TARDIS crew more of a chance to breath and the character scenes, such as those with Yaz and her family and the widower Graham returning to an empty home, felt less shoehorned in this week. Once again, the strongest performance came from Bradley Walsh. Out of all the story strands, it was Graham’s that was the most moving and made the most sense. It was clear by the end of the episode why he wanted to join the TARDIS crew (and sorry, it’s going to take a bit of time before I stop cringing at the phrase “Team TARDIS”). We are seeing a man who has lost everything – a bus driver about to embark on one last trip – and it’ll be the trip of a lifetime. Inevitable parallels will be drawn between this story and the last time Doctor Who was about giant spiders. One was a highly intelligent ethical and Buddhist parable about greed, bitterness, the consequences of humiliation on a human psyche, cruelty, egotism, and self-aggrandisement. The other was about big spiders in a hotel. My verdict on this series’ episodes so far: pretty good, poor, not bad… and then this. The special effects were suitably revolting and will have given arachnophobic children nightmares. Wooden acting from some of the guest cast. Professor Infodump was not a believable human being. The Trump parallels were heavy-handed and hohoho “You’re fired” (yet it is illegal to sack people on the spot in the UK). A police officer would have arrested Chris Noth but Yaz didn’t. Some of the dialogue clunked dreadfully. And the Doctor? Interesting that now we’re into the series, the debate about casting a woman Doctor has died down to little more than a murmur. I had some reservations about Jodie’s portrayal initially; four episodes on, and it’s probably okay to make a less provisional judgement. The character lacks the necessary weight. The Doctor is a massive personality. Sometimes, this is kept hidden, but when the full force of the Doctor’s moral outrage is unleashed, it’s terrifying. (Troughton did this brilliantly.) The Doctor’s eccentricity is part of the character but should not define it. So far, Jodie Whittaker is quirky, odd, energetic – but that’s about it. She is not dangerous. Jodie Whittaker is an excellent actor and it isn’t her fault: she has not been given the right material from the writers or the directors. It may come. It still isn’t there. The best thing about the new series is still Bradley Walsh. There’s a scene at the beginning of Arachnids In The UK that is possibly its strongest moment. You’ll have seen it several times already because it’s the one the BBC used as their preview clip. It’s the bit where the Doctor lands in Sheffield, half an hour after she left, and releases her companions back into the wild, only for a guilt-stricken Yaz to ask her back for tea. 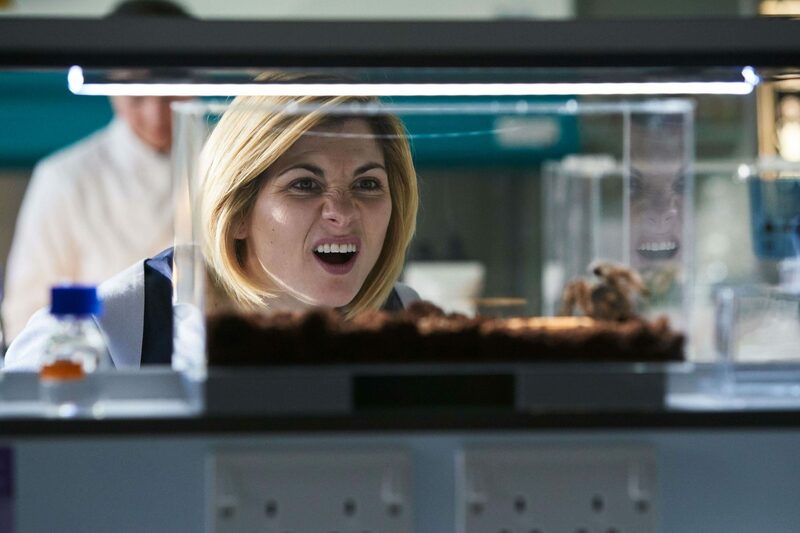 It is a simple scene, with an obvious punch line, but it is absolutely endearing – not since the Duty of Care scene in Under The Lake has the Doctor been quite so lovable – and nothing else Arachnids throws at us quite matches it. Lesson learned? Hold back your strongest material, especially when people are going to watch you anyway. Perhaps it doesn’t matter; perhaps this week the whole is greater than the sum. But there’s a sanctimonious tone to the conclusion of this story that taints it: the idea that all life is sacred, however many appendages you have. Has the Doctor never heard of pest control? Is she going after Rentokill next? When Robertson pulls the gun and announces that this is a ‘mercy killing’, you almost find yourself agreeing with him – and that, I’m convinced, is not how we’re supposed to be feeling. It all climaxes in a damp squib of a finale, the Doctor and her new friends (we’re not supposed to say ‘companions’ anymore, are we?) travelling off to new adventures in a sequence that’s supposed to be heartwarming, but simply isn’t. And as much as I’d like to put these moments out of my mind and concentrate on the good stuff, it’s scenes like this that linger like a bad smell. Perhaps it’s overstating the point, but how unfortunate that Arachnids should end its life the same way the mother spider ended hers – on its back, disorientated and confused, with all its legs wriggling in the air. In a lot of ways, Arachnids in the UK was a return to business as usual for Doctor Who. We had a scary menace lurking in the shadows (Robertson), mutant spiders, moralising, a bit of sonic, some psychic paper, and chunks of running down corridors. At one level the synopsis of any number of episodes since 2005. More than that, it’s also about a new Doctor taking time to get to grips with just who she is. We also have the essentially alien nature of the Doctor on show; despite any number of centuries of time to consider humanity, she still doesn’t get small-talk and is better at big picture problem solving than anything more nuanced. In some ways, this makes it easy to call Jodie Whittaker’s Doctor a mix of Tennant, Capaldi, and the odd dose of Eccleston and Smith. All too easy. 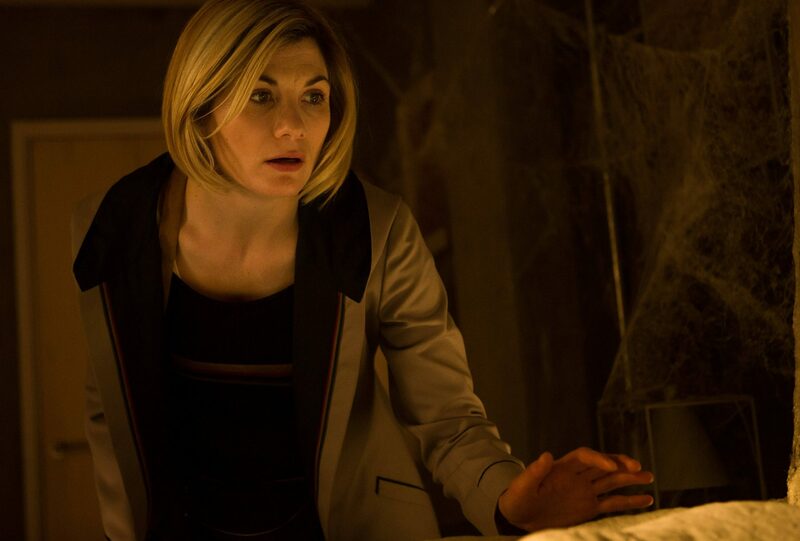 In reality, this Doctor still seems to be emerging, and we may not really see who she is until the series ends. 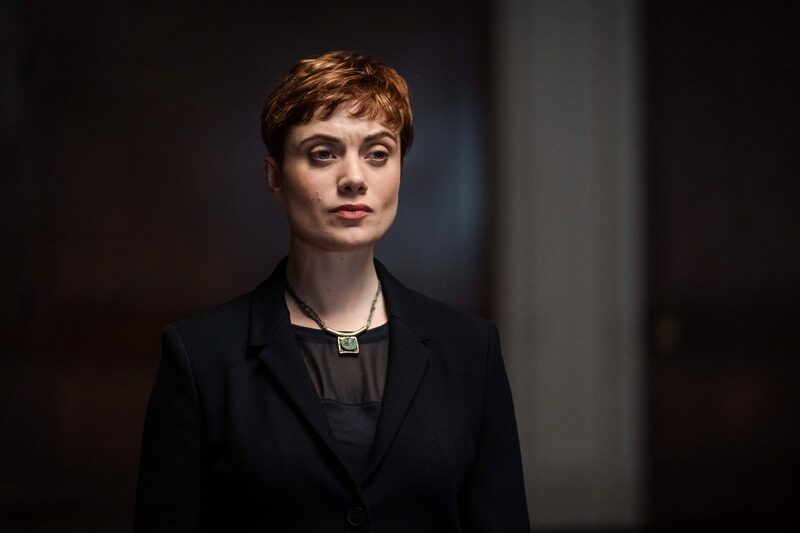 What I did pick up on from Arachnids was a level of vulnerability, starting with the awkward scene at the beginning where she doesn’t want to leave, to times where she eschewed the normal I’m the Doctor, I’m wonderful, I’ll come up with a wizard plan bravado and is instead living in a real universe where a mutant spider could cause her harm, not everyone does what she says and she hasn’t always got a get out of jail free secret knowledge from being so long-lived (dodgy garlic paste/ vinegar barrier aside). Instead, she has to work with others and comes up with an adequate solution under the circumstances, not a magic reset button or other such device. Back to the episode as a whole, there were too many characters, too many coincidences, and the Robertson character was too obviously a send-up of a certain President. 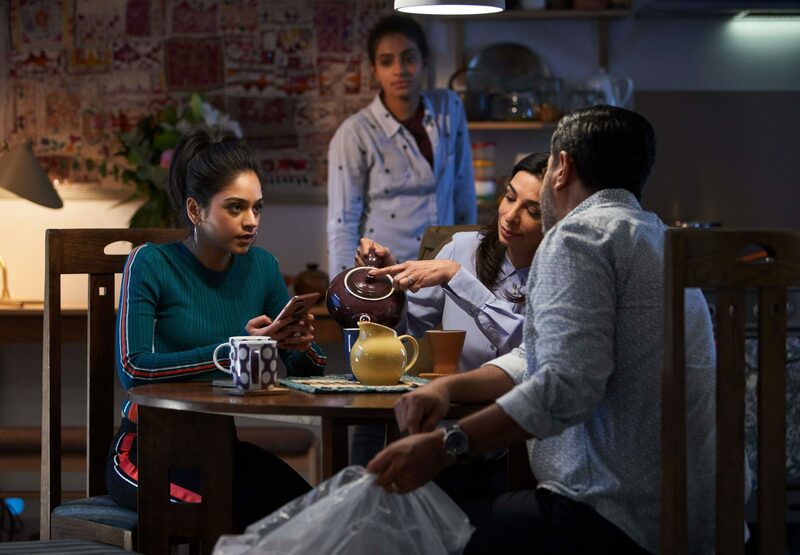 Park all that and we still have some very well drawn characters in the form of Shobna Gulati’s excellent Najia Khan and are still to fully understand what drives Yaz apart from some generalised family angst and sisterly tension. 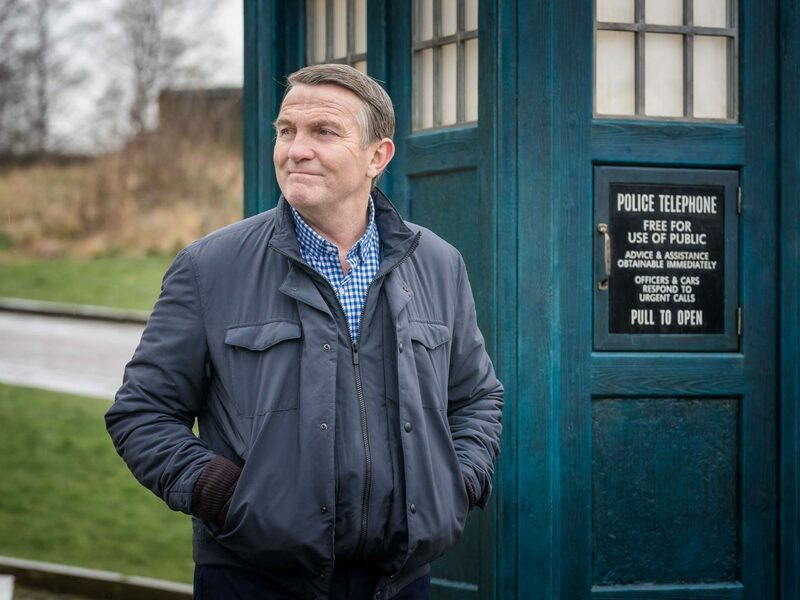 Oh, and Graham still seems the best written character and Bradley Walsh’s performance is spot on. I expect more of Yaz’s family later in the series, and who’d bet against a return for Robertson? At least there’s no more spiders! Oh dear. Chibnall’s third solo episode (not counting Rosa, which he co-wrote with Malorie Blackman) as its lead writer hasn’t gone down too well. Next time: We face quite a Conundrum!